France has a population of approximately 58 million people and is the largest West European country, approximately 4/5 the size of Texas. 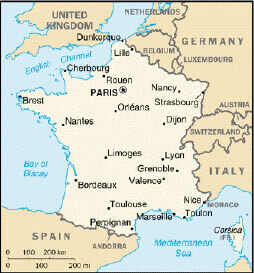 France does not have an official religion, but the majority of French citizens are Roman Catholic. France is home to approximately 4.5 million foreigners, many of whom are from other European countries or former Communist countries. Education is of great importance to the French. This is demonstrated by the fact that the educational system is almost free of charge from the primary school through the Ph.D. level, for French citizens. The French are very aware of their presence, and are extremely proud of their heritage. They boast of their long history and their important roles in world affairs, as well as being known as a world center for culture. The French are very conscientious of their appearance. Dress conservative and invest in well-tailored clothing. Patterned fabrics and dark colors are most acceptable, but avoid bright colors. French businessmen do not loosen their ties or take off their jackets in the office. Women should also dress conservatively. Avoiding bright or gaudy colors is recommended. Women should also avoid any glitzy or overpowering objects, such as flashy jewelry. Punctuality is treated very casually in France. France is a highly stratified society, with strong definition and competition between classes. The French handshake is brief, and is accompanied by a short span of eye contact. Always shake hands when meeting someone, as well as when leaving. French handshakes are not as firm as in the United States. The French have a great respect for privacy. Knock and wait before entering into a room. Additionally, do not "drop in" unannounced. Always give notice before your arrival. Business can be conducted during any meal, but lunch is best. Avoid drinking hard liquor before meals or smoking cigars between courses. The French believe this permeates the taste buds, compromising the taste of the meal. Gift giving is left to the foreigners discretion. Good gifts to present include books or music, as they demonstrate interest in intellectual pursuits. French is the official language in France. If you do not speak French, it is very important that you apologize for your lack of knowledge. Most individuals in business speak English. The French have a great appreciation for the art of conversation. The French frequently interrupt each other, as the argument is a form of entertainment. The French often complain that North Americans lecture rather than converse. Be sensitive to the volume of your voice. Americans are known to offend everyone in a restaurant, meeting, or on the street with their loud voices and braying laughter. Eye contact is frequent and intense, and can often be intimidating to North Americans.